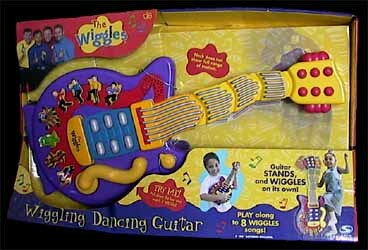 The Wiggling Dancing Guitar is another interesting addition to The Wiggles range of musical based toys. This toy can be used in two ways. Firstly your toddler can hold the guitar like they are playing it. Pressing the eight various picture buttons on the body of the guitar will start a short song based on that picture. There are also six additional button, which make various noises and there is even a tremolo bar (you can tell I've played electric guitar before can't you?) that when pulled produces a noise and causes the guitar's head to wiggle. The second way this guitar can be used is to place it standing up on the floor. This causes a large button to be pushed in, which then sets the guitar off playing a random series of the songs as the neck wiggles, causing the whole guitar to look like it's dancing. This is a really great toy. 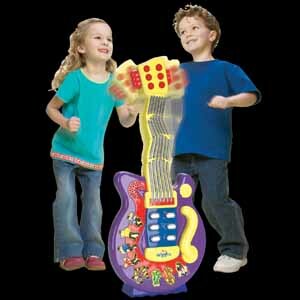 Not only can tiny tots use it to pretend to play guitar, but they can also use it to dance to. There are two volume settings, so you can either have it on loud, or at a fairly quiet level. It's also fairly sturdy, being manufactured from strong plastic, so you don't have to worry about it being dropped. I'm sure it won't be too long before the repetitive nature of the the tunes will drive granny wild with frustration, but this will certainly keep the little ones entertained for ages.